A choice of turnaround points. The shortest/easiest option is to hike to Sherbrooke Lake and back (about 6 km return). The longest/most challenging option is to summit Mount Niles (about 23 km return). There are a several options between these two extremes, including to the head of Sherbrooke Lake; to the first big meadow; to the most scenic waterfall; to Niles Amphitheatre; to Niles Meadow; or to Niles Col. Since I’m still waiting for ACL surgery and never quite know how my knee is going to be feeling from one day to the next, optionality is appealing. Starting from Calgary, Canmore or Banff, stay on the TransCanada Highway as it veers west just past Lake Louise. Once you cross into BC, start watching for the Great Divide Lodge on the right hand side. The entrance to the trailhead parking is about 400 meters past the lodge. There are no signs to mark the parking area but there are two white posts marking the turn in. After parking, look for the picnic shelter and then follow the trail that bears left past the old-fashioned pit toilet (it looks like something from Doctor Who). Less than a minute along, there’s a trail sign indicating left for Sherbrooke Lake and Paget Lookout or right to the Great Divide Lodge. The forested trail gains elevation at a slow and steady pace. Within 15 minutes, highway noise pretty much fades away (although passing trains can still be heard). There are a few small plank bridges over culverts; a couple are quite old and the planks appear hand hewn. About 20 minutes (1.4 km) from the start, there’s another sign indicating the fork to Paget Lookout. After another 1.6 km, including several short stretches of narrow boardwalks installed to protect the boggy ground, Sherbrooke Lake comes into view. This is the outlet end of the lake. There are a couple of spots to access the lakeshore, but with Mt. Ogden crowding the opposite shore, it’s hard to get the same sense of grand mountain lake that is so much of what appeals about Lake Louise and Moraine Lake. On the other hand, if you’re looking for peace and quiet, this is a much better option. We saw just 9 other people on the trail (it was a Friday). 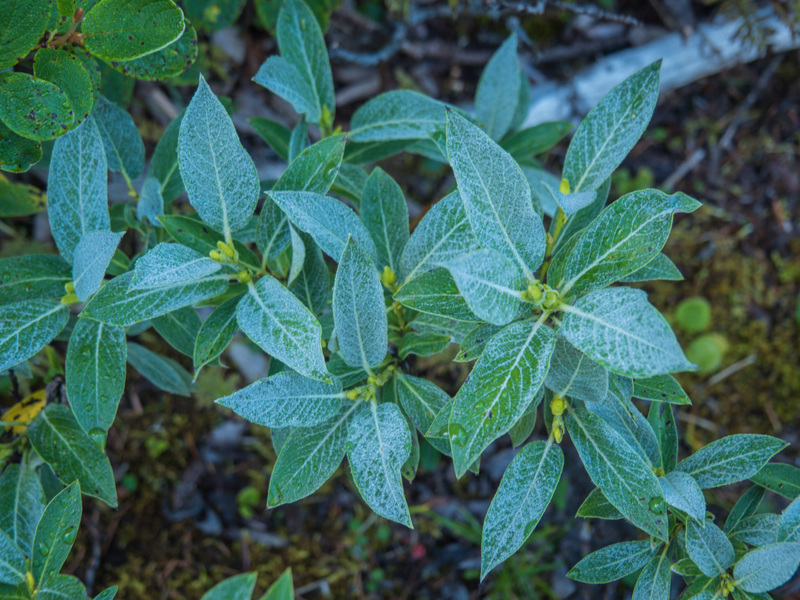 It was a cool morning and even thought it was early August, we noticed frost on the shrubs beside the trail. We took about 40 minutes to walk the 1.5 km from the outlet to the head of the lake. For one thing, we stopped often to take photographs because for much of the distance the trail is basically at the lakeshore. For another, the trail is very muddy, with low sections and multiple creeklets keeping everything very wet. The head of the lake is clogged with downed trees. For one short stretch, the trail creeps up from the shoreline but after it drops back down the trail is essentially a creek bed, under a few cm of flowing water. From the head of the lake looking back towards the highway, we saw the very tops of Mount Huber and Mount Victoria (that tower of Lake O’Hara). About 30 minutes from the lake, the trail enters a large meadow. In early August, we encountered extensive muddy sections along the trail as it meandered through shoulder-high vegetation, mostly shrubs. Two simple, wooden beam bridges cross Niles Creek, upstream of where it joins Sherbrooke Creek. We thought the most interesting thing about this first meadow was how the creek changed from clear to cloudy between morning and afternoon. 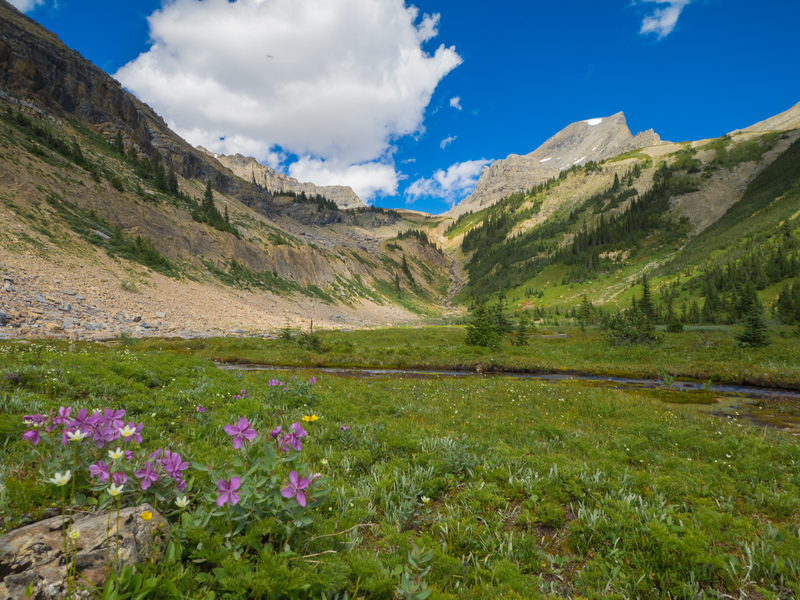 Perhaps it’s more scenic and interesting earlier in the season, when there are more snow melt waterfalls coming off the surrounding slopes and some wildflowers adding colour to the landscape. The trail through the meadow covers about 1.2 km before re-entering the woods. The second large waterfall is just 15 minutes from the meadow, just upstream from a broken down (but still functional) wooden beam bridge across Sherbrooke Creek. For the next hour or so, the trail roughly follows Sherbrooke Creek, with one crossing thanks to a convenient fallen tree. Many small tributary creeklets make for multiple boggy sections. Rely on your sense of hearing to identify the third large waterfall along the route, as the trail offers only a glimpse. 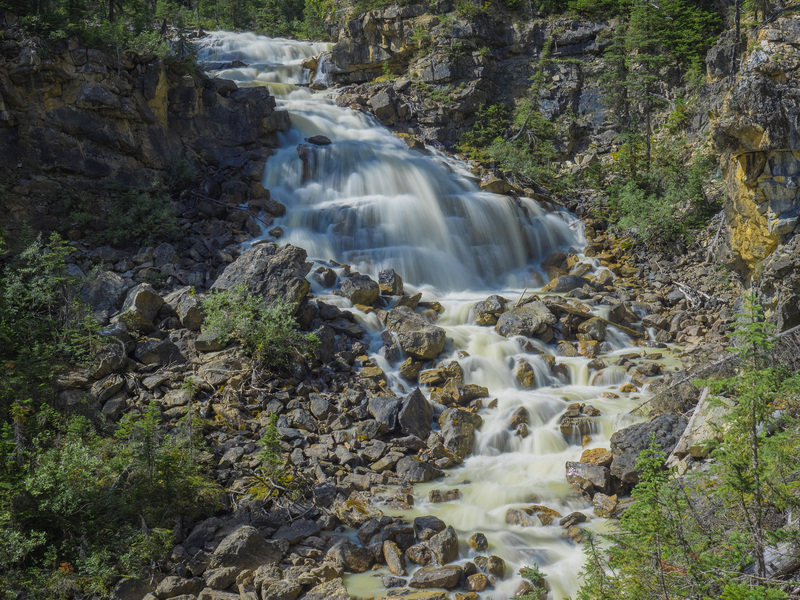 The fourth waterfall is a scenic gem, a series of large cascades falling down rock slabs; it’s best viewed from a short trail that forks off to the left. The 1.2 km stretch of trail from the fourth waterfall to the amphitheatre was steepest part of the hike (so far). K walked into the amphitheatre almost 4 hours after we pulled into the trailhead parking lot, ready for lunch. We had a walking lunch – moving to and fro in an effort to keep the black flies off as we ate our sandwiches. As we finished our cookies, we weighed three options: turn back, hike to Niles Meadow or head up the draw carved by Sherbrooke Creek to Niles Col. The prospect of looking out over the Daly Glacier (source of Takakkaw Falls) won out, so we headed to the draw. Mr. GeoK pulled ahead as we worked our way along Sherbrooke Creek, up towards the sentinel on the shoulder of Mount Niles and then to the col. He covered the 1.7 km from the amphitheatre in about 45 minutes; K and I took about an hour and 15 minutes to reach the same viewpoint. It was almost 2:30 in the afternoon when we started down, fairly late in the day for a turnaround. We hustled on the way back, taking a scant 3 hours to return to the trailhead parking lot. Our slightly different route from the col down to the amphitheatre included crossing a large patch of late season snow. The distance plus elevation gain pushes the route we hiked into the challenging category. 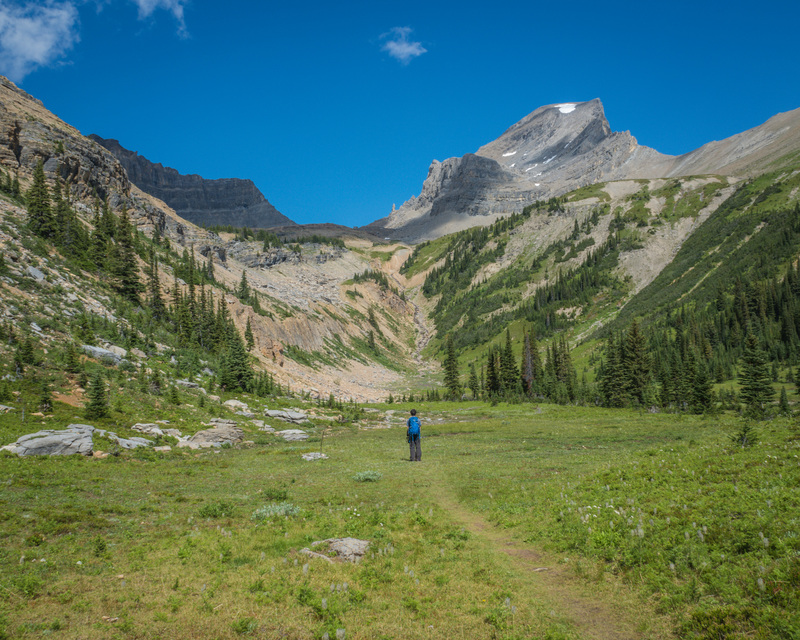 But don’t let that scare you off from visiting Sherbrooke Lake, which is an easy hike to a beautiful mountain lake that’s a lot less busy that Lake Louise and Moraine Lake. On our next visit, we’re planning to hike from Niles Col along the shoulder of Mount Niles to Niles Meadow (and maybe even peak over into the valley carved by Niles Creek) before descending to the amphitheatre. If you’ve hiked here and have other suggestions for extensions, side trips or other scenic highlights, please share by leaving a comment. Thanks..I am wishing I lived down south again so I could do more of those hikes. We did do a 10 km hike on the Klondike Trail on April 1 this year. It was along the Athabasca River near Fort Assiniboine. The scenery was nice but much different then what you see in Southern Ab. I can relate to the walking and eating scenario more then you can imagine. Hey Dwaine, good to hear from you. We did a lot of walking & eating when we were in Iceland last summer, too. That is a HUGE hike for someone nursing an injured knee! Wowza! When we did that hike 3 years ago, I was not able to push past the end of Sherbrooke Lake as I was scared to walk across a short section that was steep and angled towards a bit of a drop-off. I am curious to go back and see if my comfort level has stretched to make that a breeze on my second attempt. I know exactly the section you’re talking about. I had to practice my tunnel vision thing and ignore the drop off. I bet you could easily do it now!